Shoes - One of the best ways to help your carpets look better and last longer is to remove your shoes when entering from outside. Place a shoe rack or basket near the door to hold "outside" shoes and one to hold "indoor" slippers or shoes. Socks are fine, but avoid going barefoot on the carpet as oils from your feet can cause the carpet to soil more easily. If you want to keep your outside shoes on while indoors, place walk-off mats in the entry ways. Walk-off mats will greatly reduce the amount of soil and dirt brought into your home. The best kind of walk-off mat is one that allows you to take at least three steps on it before walking onto a carpet surface. Walk off mats need to be cleaned often, so select one that you can easily throw into a washing machine. Vacuum cleaner - A good vacuum cleaner is a carpet's best friend. Vacuuming at least once a week protects your carpet from premature wear by removing the dirt and other fine particles that can act as abrasives as you walk across your carpet. Periodic vacuuming of your upholstery will keep it looking its best. High traffic areas or a favorite chair may need vacuuming more frequently. It is best to set the vacuum height at a level that gives a slight resistance when pushing it over the carpet or upholstery. Using a quality vacuum bag and changing it frequently will allow your vacuum to function at an optimum level. Sunlight - To reduce chances of color fading on your carpets or upholstery be sure to draw the shades or draperies to keep them out of direct sunlight. Consider tinting your windows with a window film that is designed to block out the harmful UV rays to minimize chances of color fading. From time to time, accidents happen that require immediate attention. The Carpet and Rug Institute's "spot solver" offers many home remedies for removing spots from your carpet and upholstery. Anytime a spill occurs it should be cleaned up as soon as possible. The chance of removing the spot or stain from your carpet or upholstery is 75% greater if the spill is attended to immediately after it occurs. For most food or beverage spills or pet accidents, blot as much of the liquid or debris as possible with a dry cloth or paper towel. Next, use a white terry cloth towel, and press it deeply into the spill, blotting it dry. Don't rub or scrub your carpet or upholstery with a rag or brush, as that will only damage the fibers and permanently scar the appearance of your carpet or upholstery. If the spot is still present, apply clear, warm water and blot it dry again. If clear water does not do the trick try using a solution of mild, non-bleaching detergent that does not cause excessive foaming. (Most grocery store brands tend to leave too much residue.) Apply the cleaning solution and let it set for up to ten minutes, then rinse thoroughly with warm water and blot it dry. Use a shop-vac to remove as much of the moisture as possible; if you don't have a shop-vac cover the area with a white terry cloth towel, weighted down and allowed to set for several hours. Stubborn stains may require professional extraction. Sometimes a deep spill will appear to have been removed only to reappear days or even weeks later. Carpeting and upholstery are some of the most expensive investments in your home. To protect your investment it is necessary to have them properly cleaned by a professional cleaner at least once a year. When you call professional technicians be sure they begin with a carpet inspection, and identify any stains or other items that may require special attention (along with details such as the cause of the stain.) Regular cleaning will preserve the fiber strength and beauty of your carpeting and upholstery. 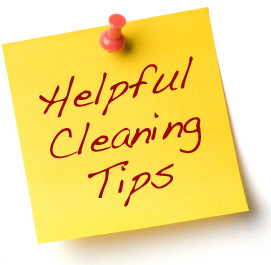 Don't wait for your carpet or upholstery to look dirty before having it cleaned. Carpet can hold up to a pound of dirt per square foot before it starts looking dirty! Regular, professional cleaning, with a truck mounted, hot water extractor, also improves your indoor air quality and helps to sanitize the carpet by removing dust mites, pet dander, bacteria, pollen, and allergens. This process allows allergy suffers to feel more comfortable in their homes. Carpeting and upholstered furniture enhance the beauty and value of any home. They provide the atmosphere for the room and allow the accessories to stand out. Regular, professional care will help your carpet and upholstery keep looking beautiful for years to come.